For when Kacie doesn't make the squad. Haha. That floor has seen alot of messes! if Cally would never mop or clean the kitchen floor nothing would get spilled. That is my experience anyway... as soon as I would get the floor mopped... ka-blam somebody would drop a gallon of milk or koolaid or a bottle would shatter... messes galore at my house. And great job spelling it. But can you say it? That is one word I can never figure out how to say properly. OK, you are cracking me up. Your kids are never going to suffer through major disappointments! 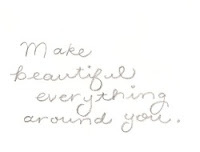 Your pictures solve everything! You guys should get a pooch so he can be on cleanup duty all the time. I broke down and set up a blog....kinda. I might need your help cause I dunno what is going on. What a mess, and it is expensive! You crack me up Cally. I guess when you figure out how to look at the spills then they aren't so frustrating. Can't wait to see what you come up with for the next one. 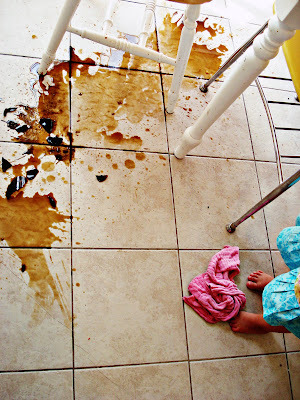 One could probably dedicate a whole blog to spills=life disappointments. Maybe Kacie is going to be a chef...worchestershire...why in the world would she even have that stuff? And, the big question is did you have to look at the bottle to spell that right? Ew, and it stinks, too, Emma. And Alice, I actually studied the word worchestershire during one of my nightly dictionary readings, so I did not have to read the broken bottle. Kacie got it out to put on her ice cream. I told her it would be gross, and she dropped it. And you're right Sheila. I'm grateful for the messes...you never know how gross your floor really is until you're on your hands and knees cleaning up a stinky sauce.